Red Fronted macaws, Ara rubrogenys, are the smallest of the large macaws. Fairly rare and therefore not well-known, Red Fronted macaws are olive green with bright red on their foreheads, ear coverts, shoulders and socks. Their under-wings are flames of red, orange and yellow. They have teal colored feathers in their wings and tails. Juvenile Red Fronted macaws have green foreheads and begin to molt in red feathers on their foreheads at six to twelve months of age. One thing to note is that Red Fronted Macaws have a bare patch of skin around the eye but lack the bare cheek patch of the large macaws. Red Fronts are generally around 24 inches in length and weigh between 450 and 550 grams. Their wingspans are generally 32 to 34 inches. They are from one remote valley in Bolivia in South America. Red Fronted macaws are lovable, friendly smaller macaws, although they are still considered to be one of the large macaws. 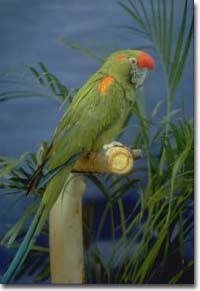 They have a body the size of a medium to large Amazon parrot with a longer pointed tail. Considered by many to be the ideal size of macaw, they are fun loving and make wonderful pets. Red Fronted macaws can become excellent talkers and are quite the comedians. They are not dominant birds. From my perspective as a breeder, Red Fronted Macaws are unique birds. They are extremely affectionate, intelligent, playful, gentle spirits in graceful, moderately sized bodies. They are the noisiest babies in the nursery, honking loudly whenever someone enters the room. The baby Red Fronted macaws run to the side of their tub nearest the brooder door to see what is going on and if they are about to be taken out and cuddled. "ME! ME!" they seem to be saying. In addition to being extremely vocal, Red Fronted macaws are also extremely cuddly with each other and with their hand feeder. Once they start exploring from their natural baskets and eating a bit on their own, the frequent vocalizing gradually reduces to only vocalizing when they really want something. When toddling around after emerging from their baskets, young Red Fronted macaws seek people out and enjoy napping on their laps. Otherwise they collapse in feathered heaps wherever they find themselves. They often sleep on their backs, a sight which can be unnerving to the uninitiated. Young Red Fronted macaws will lie on their backs and play with their toes, or play with a toy, and some will even continue this behavior into adulthood. They will also play on the floor with each other and roll around like kittens or puppies, wrestling and holding each other's feet. I often find 2 or 3 of them in my lap at one time playing or snoozing. As the young Red Fronted macaw chicks begin to mature, they become coy and won't look directly at you. As they continue to mature, they will become friendlier again and grace their owners with their charming and unique behavior. Red Fronted macaws are strong fliers and have the ability to fly straight up, like helicopters, and hover. They are so light on their feet I think of them as my little flying angels. When Red Fronted macaws learn to fly they really thin down, more so than most other species. They fly lightly and can go straight up, sometimes leaping into the air as though the wind caught them and tossed them there for an instant's hover before coming back down to earth to the exact same place they started. Red Fronted macaws are precision flyers, going directly where they want with clear intention. On average, we leave them unclipped the longest of any of the babies because they are orderly and not the least obnoxious about flying. When a Red Fronted macaw lands on me, my feeling is that an angel has landed softly. As they mature, Red Fronted macaws remain physically affectionate. They love to cuddle and tunnel under towels or blankets. One of my breeder Red Fronted macaws, Loro, observed me sitting on the edge of a table talking with some students and gesturing with my hands. He came up and cocked his head and watched for a little while. He climbed into my lap, put his head down between my trousered legs, stood on his head and waved his tail back and forth like a metronome in front of my face! He instantly got what he wanted - to be the center of attention. Red Fronted macaws are also the most empathetic of the macaws. They will sense and respond to your every changing mood. This can be good and bad, as they mirror your mood and respond with affection or agitation. The main downside to Red Fronted macaws is their voices. They are loud and frequently try to communicate with their voices. They are considered a bit on the squawky side, and that is the primary reason someone would not select one for their home. However, the squawkiness tends to decline as they become mature. In practical terms, Red Fronted macaws are social and can be quite loud when left alone; if they know their flock (family) is nearby but out of sight they will call to them to stay in touch. They are extremely flock-oriented and want to be in the middle of things. They need a lot of interaction. While they can be incredible companions for people in single-bird households, they especially thrive in households with multiple birds, since there is always someone to talk to and feel companionship with. Red Fronted macaws are a delight to have around and bring much energy and joy to their homes.